Back to Pompeii by Kim Kimselius is the first in the Ramona and Theo series of novels. The series follows the adventures of Ramona, a modern day Swedish schoolgirl, and her boyfriend Theo in different historical periods and places. The series has been a success in Sweden and some of the earlier volumes have been translated into other languages. Back to Pompeii is the first English translation (by Jennifer Lee), and was published in 2013. Ramona is taking part in an educational trip to the ruins at Pompeii with the rest of her class. Plagued by a headache, she steals away from the tour to rest in the cool shade of a bakery. She falls asleep, and wakes to find herself 2000 years back in time, in a very lively Pompeii on the eve of the volcanic eruption that will bury the city and its people in ash. Ramona is torn between delight and fear. Delight at finding herself in ancient Pompeii among the living people whose plaster death-casts she has seen in the museum, and fear of the coming destruction. More, as she has no idea whether she will be able to return to her own time, she fears even if she survives the eruption that she may be stranded in this ancient world for the rest of her life. One theme of Back to Pompeii is the value of friendship. Ramona’s fears are quietened when she meets and is befriended by Theo, a boy of her own age. Theo is an upper-class Roman who is first beguiled by Ramona’s bare legs. (She was transported back in time dressed exactly as a modern teenager on holiday in Italy.) Theo borrows appropriate clothes for her from his rather haughty sister Livia , and then presents her around as a cousin from Rome. In Theo’s home Ramona is welcomed as his friend. The story is an enjoyable and easy read. It is quite a short book – about 50,000 words – and it wears its historical costume lightly. By this I mean the book conveys a deal of information about life in Pompeii – about dress and custom and what may have happened when Vesuvius erupted – well integrated with an exciting story. Ramona is a believable teenager, and for the most part so is Theo. If Theo’s family and friends seem surprisingly laid back about Ramona’s sudden appearance and Theo’s friendship with her, then that is perhaps explained away by the conventions of the genre. This is a time-slip novel that isn’t interested in the how or the why of the slip. It is neither science-fiction nor fantasy (no time machine, no magic). The slip in time is simply a vehicle to put a modern girl into an historical milieu. Ramona’s attempts to explain certain things modern kids would take for granted are quite funny. An aeroplane, for example. Kim Kimselius is rather good at pulling her readers up short. Making them reconsider their assumptions about their own time and about the historical period her characters are living in. Speaking for a moment as a teacher, I can see a particular value in the novel as a teaching tool to introduce the idea of prejudice and to give concrete examples to debate without personalising the issue. The book highlights one particular aspect of ancient Roman society: slavery. To begin with, Ramona fears she may be sold as a slave, a fear that recedes as she gets to know Theo and his family. But the presence of slaves as a class in Pompeii is never allowed to fade away and at a critical moment Ramona’s early fears are made real again when she and Theo are separated. The threat of violence and sexual abuse that Roman slaves must live with runs like a cold current just below the cheerful surface of this novel. The impending doom that hangs over Pompeii is another undercurrent that takes a dramatic centre stage in the latter part of the novel. In good disaster movie fashion, Ramona sets out to save the lives of the people she has met. The reader cheers her on. But she is frustrated at (almost) every turn. No one believes her. How is it possible that Vesuvius, green with vineyards, is really a dormant volcano about to blow its top? Yet it does, and the choking ash that finally and inevitably lays a suffocating blanket over the city is frighteningly described. Obviously, Tillbaka till Pompeji was written with a Swedish audience in mind. How would it work with an English audience? I imagine a frisson of curiosity when a young English reader realises that Ramona and her fellow school children think of and talk to their teacher as “Elisabeth” rather than, say, “Ms Andersson”. However, most of Ramona’s other assumptions would, I think, be shared by English-speaking girls of her age. The translation is generally good and appropriate, though at times the vocabulary seems to hover between British and American. For example, the school children “queue” for ice-cream (rather than “stand in line”), but Ramona talks about “airplanes” (rather than “aeroplanes”). Still, I don’t suppose these uncertainties would be disturbing for most readers in the target audience. One language point that caused me confusion – at the most dramatic point in the story – are the references to flying “chunks of lava”. To the best of my knowledge, lava is molten (liquid) rock, and as such cannot form “chunks”. The rocks spewed out by explosively erupting volcanoes are better described as hot rocks, surely? If a technical term is called for then they are pyroclasts or tephra. (Yes, I looked that up!) I am not sure whether this slip is the responsibility of the translator or the author. Kim M. Kimselius is the author of Back to Pompeii. Visit the author’s website to contact her or learn more about her books (English). Or visit her blog (Swedish). 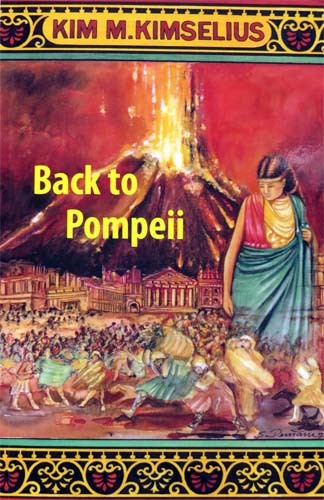 Buy copies of Back to Pompeii from AdLibris or Bokus. Read reveiws of her other books (various languages) on the GoodReads website. This review was written as a contribution to the Swedish Egenutgivarnas Recommendation Tree project. Originally published on the separate At the Quill website. Copied to TheSupercargo main website 30 Dec 2016. Some minor adjustments for spelling, grammar and SEO. And I added a featured image. Thank you so very much for your long review of my book Back to Pompeii. I appreciate that you pointed out some of the faults in the translation, will correct it next time we print the book. My pleasure. 🙂 I want to stress that I thought the translation was generally very good. There were just a few things my eye snagged on. I hope Back to Pompeii attracts the readership it deserves also in English.